"…it is a pleasure to encounter this single-disc to that award-winning set, [Vol. 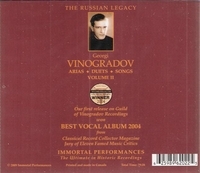 I, V0344]....Vinogradov is a sensitive musician with a most attractive vocal quality....like Schipa, he recorded much lightweight material - indisputably suitable for its day, but to contemporary ears perhaps representing opportunities missed....Purchasers of the earlier set [V0344] are unlikely to need further recommendation to add this new arrival to their collections." “ Georgi Vinogradov was one of a baker’s dozen of outstanding Soviet tenors who could be heard in the 1940s and 1950s. Only Lemeshev and Kozlovsky developed international reputations, and that really hasn’t changed over the years. Yet arguably, Vinogradov possessed the most beautiful voice of the lot, or shared that distinction with a young Ognevoi. He was essentially a radio singer who made his first recordings in 1938, and continued enjoying the prominence that comes with both broadcasts and commercial recordings through the mid 1950s. His many recordings reveal a remarkably sweet lyric voice, excellent enunciation, and an easy production that never displayed vocal strain. He was also a first-rate interpreter in intimate Russian romances, where his endless resources of color and natural, speech-like rhythms created a string of successes.